They can suspend a 6-year-old for pointing a banana at a classmate, but 39 complaints? On Wednesday February 14, 2018, 9-year-old Nikolas Cruz slaughtered 17 students and adults at Marjory Stoneman Douglas High School in Parkland, Florida. The day after the shooting on Thursday morning the local FBI chief responded to the reports of a threat shooter Nikolas Cruz made on YouTube in 2017. “Nikolas Cruz” posted this comment on YouTube. On Thursday morning the local FBI chief Robert F. Lasky responded to reports of the online threat made by killer Nikolas Cruz. 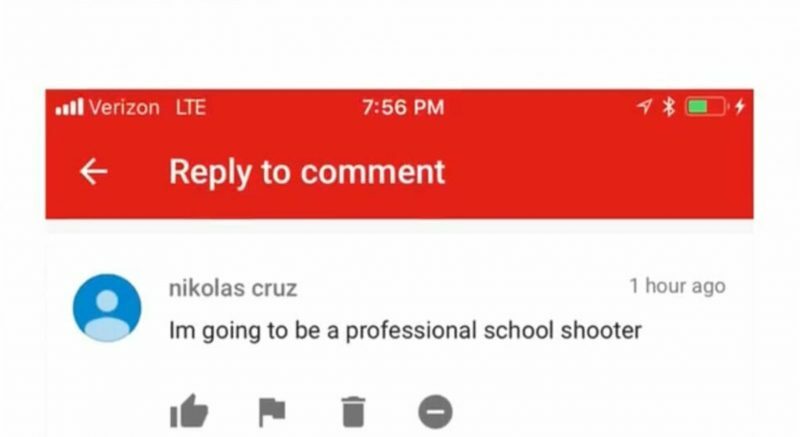 The YouTube comment was posted by “Nikolas Cruz” – spelled with a ‘K” – and yet the FBI said they didn’t know if it was the same person? Killer “Nikolas Cruz” used his real name on YouTube. Killer Nikolas Cruz ALSO used his real name on Instagram where his account is loaded with several photos of Cruz in a mask with a gun. His Instagram account stretched back from 2015 through 2017. Cruz likely used his real name and photos on Facebook too. The account was taken down immediately after the shooting. On that Friday the FBI admitted they dropped the ball on Nikolas Cruz. And now two weeks later the FBI admitted they never looked into the YouTube threat by Nikolas Cruz. They never even called YouTube. They didn’t call Facebook or Instagram either. They didn’t bother. And today 17 people are dead in Parkland, Florida. Read more at TGP. The FBI had the school shooter’s name and failed to investigate. Never forget this for all your living days. And they want us to give them all our guns & they can protect us. What!?!?! What’s baffling is an FBI special agents son goes to that school. I’m trying to put myself in his shoes. If I were a parent of a child going to a school and credible threats were coming into the place of my law enforcement FBI employment what would I do? Something stinks there.